Big Skies Bike Rides is the name given to eight cycle loop rides 'launched' in 2010. They take their name from the phrase used by David Hockney when he compared the sky over the Yorkshire Wolds to 'the big sky' he experienced in the American West. 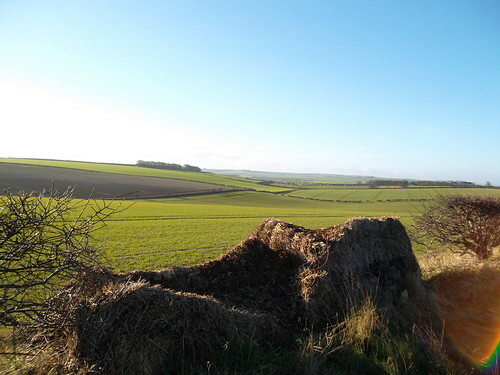 This 23.5-mile route starts in Bridlington and passes through Bempton, Buckton, Grindale and Rudston. I almost failed to get off the train at my destination. A simple soul unused to public transport, I stood at the left-hand side of the carriage waiting to get off from the door I had entered and from which all other passengers had got on and off between Bridlington and Hull. I think I expected the doors to open, then I realised that there was no platform on the left side and I punched the yellow button and got off on the right side, seconds before the train pulled away from the platform. I had to turn my little map upside down to work out which way to go (left from the station as it turned out) and cycled in to Bempton. 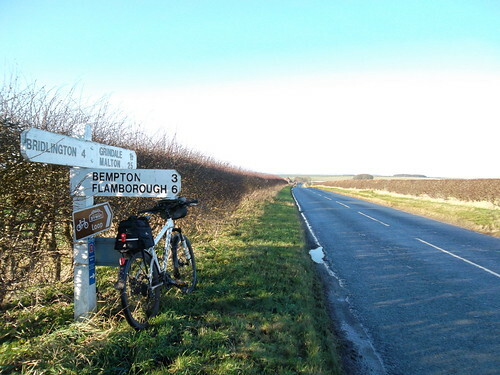 The route to the cliffs is well sign-posted as it's on the Yokshire Wolds Cycle Route. 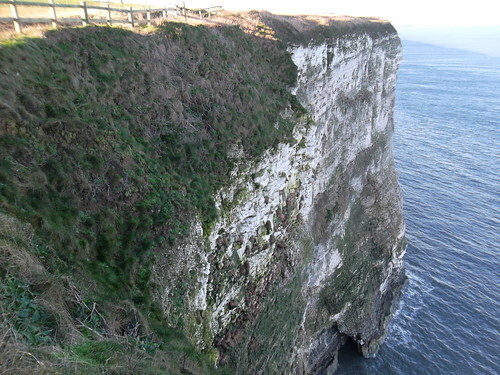 Back in April, when we did the Route, we didn't go to the cliffs at Bempton. I had never been before (although I've visited nearby Flamborough many times), but I knew there would be little birdlife to see at this time of year. So this wasn't an oversight. Unlike forgetting to bring a pump, the correct size inner tubes, my water bottle and the book I wanted to read on the train. At least things couldn't get any worse. Future visitors to the Bempton cliffs might have seen my unintented vandalism if I hadn't quickly confessed my sin to the chap in the shop; as I rode up looking for something to lock my Ridgeback to I thought I would lean it against one of the two benches that were overlooked by the shop. Unfortunately, my front tyre sunk in to what turned out to be a concrete hardstanding that had just been poured that morning. By the time I returned from the cliffs the chap in the shop had tamped it down again with a big stick. If you do this ride from 2012 onwards there may be a bike shelter by the time you visit, but in any case you should lock your bike outside the visitor centre close to the cliff top. The hardstanding was for the bike shelter, apparently. It's a surprisingly undulating road to and from the cliffs, then off towards Buckton along the potentially busy B1229. Although many vehicles passed me going in the opposite direction I think I counted only five or so that overtook me in approximately 16 miles from Bempton on the loop back to the outskirts of Bridlington. It's a steady climb from Buckton to the crossing of the A165 (a busy road between Bridlington and Scarborough). I was struggling in to a headwind with my heavy bike and poor physical fitness. After crossing the main road a very well-surfaced narrow road takes you to a T junction close to Grindale. It's unusual to cycle on roads in the Yorkshire Wolds that have road markings. Despite being on a normally quiet National Byway local loop I found the route between Grindale and Rudston to be unexpectedly busy and not particularly pleasant to cycle along. 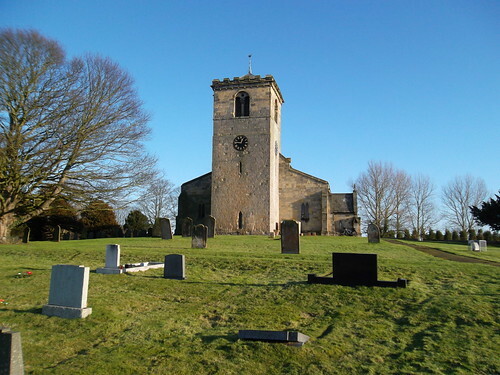 Parts of All Saints church in Rudston date back to 1100. I was looking forward to visiting Rudston, and seeing the the church and monolith (actually a megalith, according to Wikipedia). After photographing the church I set off looking for a 26ft tall standing stone. Not easy to miss you may have thought. But miss it I did. All the pictures I had seen show it in isolation, but it is actually very close to the east and far side of the church. I had imagined I would lean my bike near to it to take a photograph and give some idea of scale. However, I still felt a bit squeamish after stepping over graves to see that of Winifred Holtby, so I didn't weave my Ridgeback between the headstones that surround the stone. Besides, it is estimated to weigh about 40 tonnes, and it had been really windy. 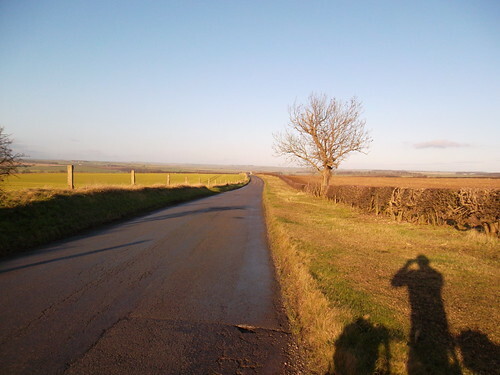 More gentle climbing to get out of Rudston on a road marked Burton Agnes – I think the Big Skies leaflet should have mentioned that. At the top of the hill a chevron warns of the tight bend to the right, but it's left back to Bridlington. There is no sign informing you of this, though, just a stick-on NCN route 1 sign wrapped around a post. Just head towards the communications mast. I have allowed my Ridgeback MX5 to become neglected. I very rarely shift the chain off the middle chain ring and it seems I use only three of the rear sprockets on my commute. In fact, on some of the stiffer sections I had to coax the front derailleur on to inner ring with a careful application of the heel of my right boot. On larger cassette sprockets the drive train gave out worrying noises after finding itself in an unfamiliar position. Finally, on the way back to Bridlington I lifted the chain on to the big chain ring. By now the westerly wind had died down, but it was the most enjoyable section of the day's ride. It's not all downhill along the Roman road back to the coast and there are a couple of short stiff climbs before dropping down to the A165. At this point the route would go left and – assuming a start at the alternative of Bempton – towards the promenade and Sewerby. But I was pushed for time and knew I had no way of making it back for the 13.57 from Bempton. 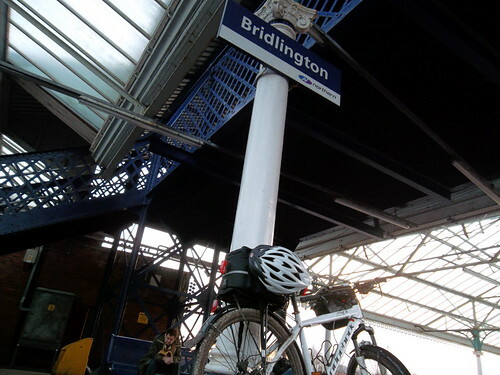 So I took the city centre A road to Bridlington station and was five minutes late for the 13.41 from there. Maybe it was the westerly wind on this ride, but I think it should be done clockwise. The Roman road is quieter than the others, a rewarding ride and mostly uphill if ridden from the coast. The other sections (Buckton to Rudston) are also uphill from the coast, but busier, especially from Grindale to Rudston. I think it would make sense to do the busier roads downhill and savour the quieter Woldgate Roman Road. 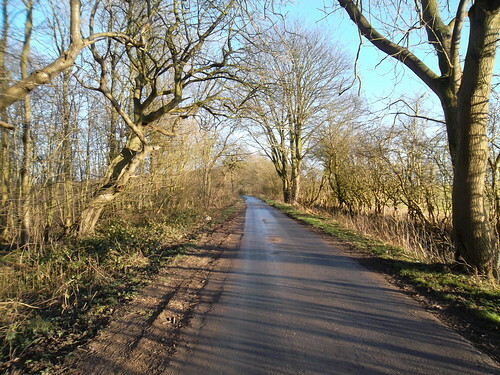 The Yorkshire Wolds Cycle Route recommends a clockwise direction on much of this route. I was suprised how hilly this loop turned out to be, so it was much more interesting than, say, the Driffield ride. 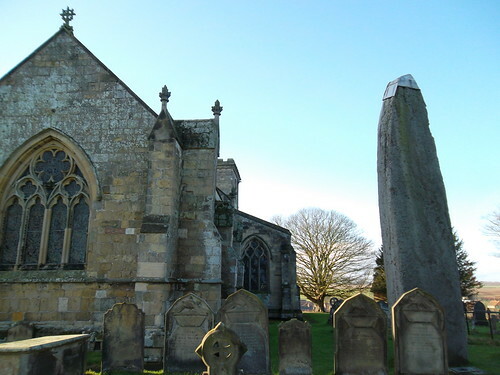 Rudston, with its standing stone and church were well worth the trip. 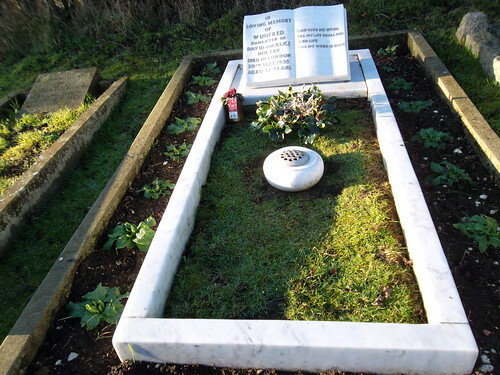 And fans of Winifred Holtby's work may want to pay a visit to her grave. Anyone arriving from the south by train to do this ride should consider my tip and start from Bempton. Another tip would be to remember to bring refreshments, a pump, the right inner tubes, and maybe a book. South Riding anyone...? 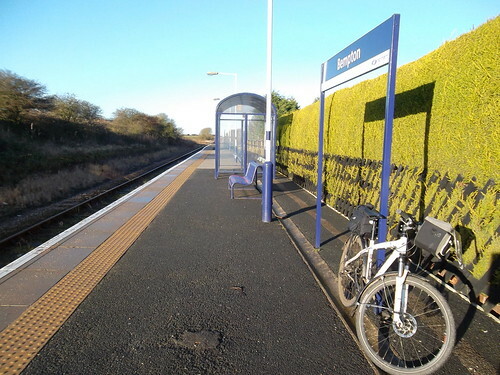 In a way I was glad I didn't make it back to Bempton, partly because I'd ridden that section of the route before, but mainly because I wouldn't have visited the station at Bridlington. I think they have an impressive display of flowers in the summer months, and it is a lovely traditional station. 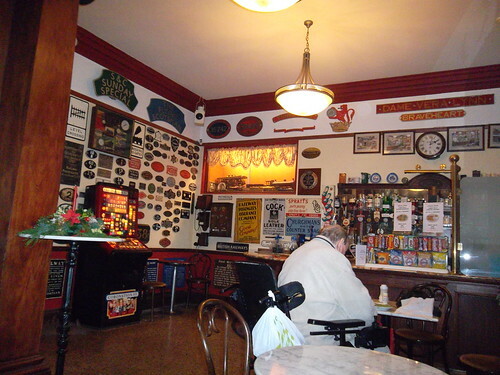 The bar is licensed and is packed with railway memorabilia – possibly a bit too packed, actually. Get rid of that Coronation Street fruit machine and reinstate the open fires, I say. ... fortunately, both cycle racks were empty, but another cyclist got on just after me. And he was going to Sheffield. I wonder what would have happened if there had been three of us waiting on the platform. Posted by Chris on December 22nd, 2011. A very interesting read and plenty of good photos to enjoy. All those open roads looked enticing. It's made me want to visit that part of the country again. Thank you! Your megalith is twice as high as mine! As you say you wait ages for a standing stone then 2 come along at once! Strange... We also uploaded our photos simultaneously – mine are intermingled with yours! Well done completing the series of Big Skies Bike Rides Chris. Good report. 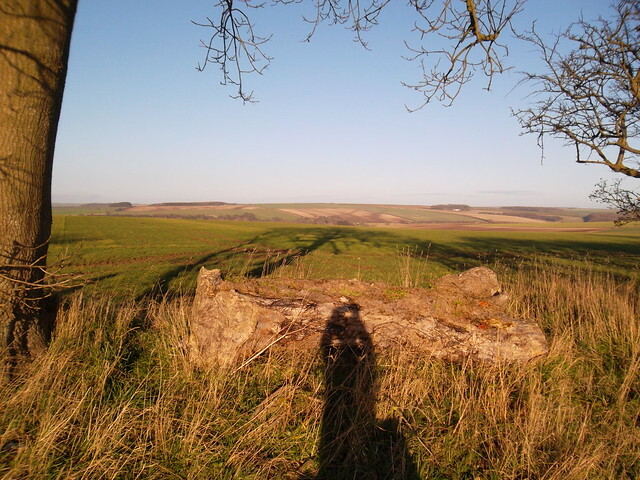 I'm missing the Wolds actually, and looking forward to the next one. Nice ironies here – two simultaneous standing stone reports and a cycling shelter vandalized by a cyclist. We always found taking bikes on trains to be nerve wracking, but only in Europe – in Romania we once stood them on-end in a lavoratory. Canada's train network is so linear the thought of taking the train (let alone our bikes) wouldn't cross our minds. i see it's the return of 'the shadow'!! Good thing you noticed the vandalised concrete. It would be embarrassing to return from a tea stop to find the wheel buried in set concrete. ... but it would be good to have a bike shelter with a bike wheel concreted in. Very surprised to see a standing stone in a Church yard.. I wonder if they simply built the church around the stone? Why didnt they simply build it else where? Great ride by the read of this Chris. Fantastic photos as usual, I suppose there isnt much in the way of shelter with the gales blow, your lucky that the rain was now where to be seen though. Gales and rain tend to go together where I am. that looks like a great ride. 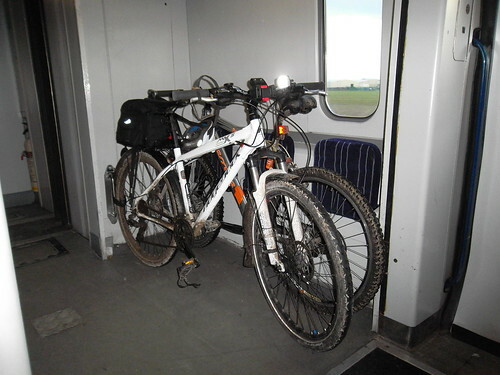 In general, Northern Rail staff have the power to be flexible- as long as the train ins't too crowded and bikes aren't blocking the aisles and the exits they will allow the odd additional bike on the train. The prime concern is to ensure that everyone is safe.